Ever had the need to install multiple programs on a new or existing PC? We have all been there; a brand new PC out the box, a relative who needs some software installed, a re-install of windows on your own PC. So how do we go about collating all our software, is there a nice quick way to re-install everything and get us up to date quickly. Well today we are going to go over the basics of how to install multiple programs using Chocolatey. Chocolatey is a package manager for Windows (like apt-get or yum but for Windows). It was designed to be a decentralized framework for quickly installing applications and tools that you need. How can I install chocolatey? Very easily. 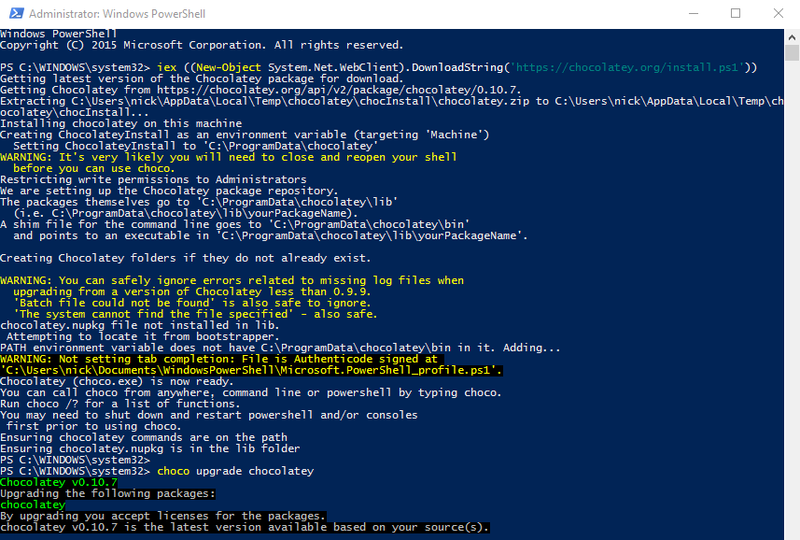 Chocolatey is built for windows and use through Powershell, so as long as you have been updating windows, you should be able to install it seamlessly. Hope this is of some help. If you are not wanting to install multiple programs, don’t want to mess with powershell as mentioned in previous posts, perhaps Ninite will be better suited for you.